ADEN – An air strike on Yemen’s Red Sea port of Hodaida destroyed a dairy factory on Tuesday night, killing 25 workers, medical sources said, in what appeared to be one of the biggest cases of civilian deaths in a Saudi-led campaign against Houthi militia. The operation by Saudi Arabia and other Sunni Muslim states is aimed at stopping the Houthis and former president Ali Abdullah Saleh winning control of the country and at reinstating Saudi-backed President Abd-Rabbu Mansour Hadi. However, after seven nights of air strikes targeting both the Houthis and forces loyal to Saleh, the coalition has not managed to secure Hadi’s control over his last remaining enclave of rule in the southern port of Aden, a key aim of the campaign. The sound of gunfire and several large blasts were heard in Aden throughout the night, a Reuters reporter said. Videos posted online, which Reuters could not immediately confirm, appeared to show fighting at an army base loyal to Saleh in the northeast of the city. Residents near the Hodaida dairy factory said it was located near an army camp loyal to Saleh, while medical sources in the city said the 23 casualties had all been workers at the plant and that the strike had also destroyed a fuel store. 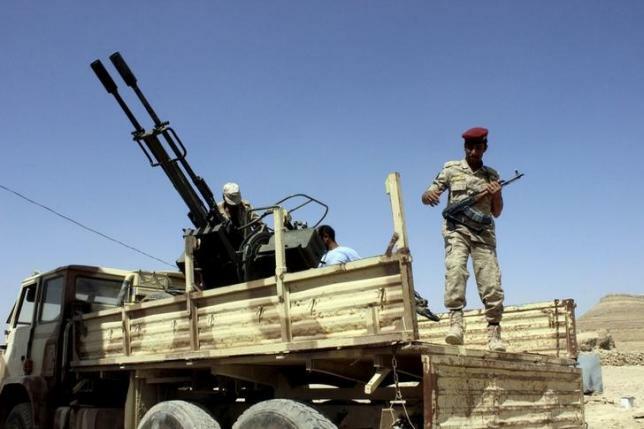 A raid at a coastal defense station at Maidi port in Hajja province north of Hodaida killed six soldiers, workers there said, while further strikes hit an army camp in Sanaa and a government facility in Saadeh in the north of Yemen. In New York, UNICEF said late on Tuesday that at least 62 children had been killed and 30 wounded in fighting over the past week, and the United Nations said an attack on a refugee camp in northern Yemen, which medics blamed on an air strike, broke international law. An Indian naval patrol boat picked up nearly 350 Indian nationals from the port of Aden on Tuesday night, and was expected to arrive in Djibouti during the day, a spokesman for the Ministry of External Affairs said. More than 4,000 Indians – more than half of them nurses – are believed to have been in Yemen when Saudi Arabia launched air strikes last week. Negotiations are under way to allow evacuation flights into Sanaa, where the Indian community is concentrated, and receive permission to evacuate more from Hodaida, the spokesman said. Meanwhile, Saudi troops clashed with Yemeni Houthi fighters in the heaviest exchange of cross-border fire since the start of a Saudi-led air offensive last week, while Yemen’s foreign minister called for a rapid Arab intervention on the ground. The conflict has brought civil war to a country already on the verge of chaos and forced Washington to evacuate its personnel from one of the main battlefields in the covert US drone war against al Qaeda. Residents and tribal sources in north Yemen reported artillery and rocket exchanges along several stretches of the Saudi border. Explosions and heavy gunfire were heard and Saudi helicopters flew overhead, they said. In the southern port of Aden, Houthi fighters and allied army units pressed an offensive against forces loyal to Hadi, trying to capture the last remaining major stronghold of the absent president’s forces. At least 36 people were killed when Houthi forces shelled Hadi loyalists in Aden. Jets from the Saudi-led coalition bombed Houthi positions near the airport. Further west, Houthi fighters entered a coastal military base overlooking the Red Sea’s strategic Bab el-Mandeb strait, local officials said, when soldiers of the 17th Armoured Division opened the gates to the facility.